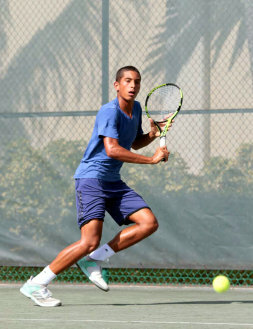 Playing in the Men’s Singles, Mallory came from behind to defeat number eight seed Romani Mayers from Barbados 3-6, 6-2, 6-4. Mallory would then team up with Philippe Mercelina from the Netherlands and they needed three sets to defeat the number three seeds Griffin Daehnke from USA and Monty Graveney from Great Britain 6-4, 3-6, 11-9. Mallory then had his best win ever defeating the No. 1 seed in the tournament Jeffrey Fradkin of the United States in a convincing match 6-4, 6-1. Mallory’s opponent was not only ranked No. 1 in the tournament but has a combined ITF world ranking of 480. This is the highest level that Mallory has attained to date and no doubt he will be in contention for some increased ITF ranking points.